Every travel agency business needs to have a professional and good-looking website so clients can swipe through travel and tour offers easily because people tend to search online first. Having an engaging and intuitive website will help you succeed in this niche. The easiest way to build a beautiful website from scratch fast is by using a theme. With this in mind, we have shared in this article our top favorite travel agency WordPress themes. The theme presented below have stunning designs and layouts, are 100% responsive and cross-browser compatible, SEO friendly for increasing your position on search engines. In this list you will find 20 powerful travel agency WordPress themes and there is no doubt that you will discover the perfect one for your business. Enjoy! 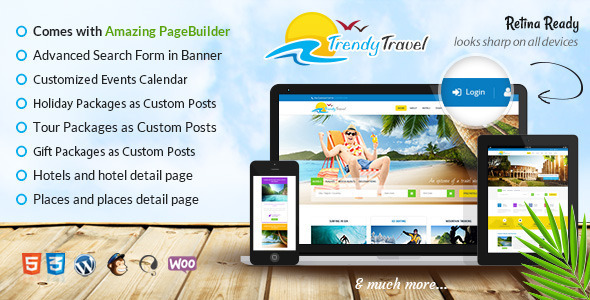 Travel Tour is a stunning, highly customizable, and user friendly travel agency WordPress theme ideal to show off your business using a professional platform. Using Travel Tour you can flawlessly build the website of your dreams thanks to its integrated GoodLayers page builder. If your travel agency sells group packages you can create custom ones using the native feature of this theme. 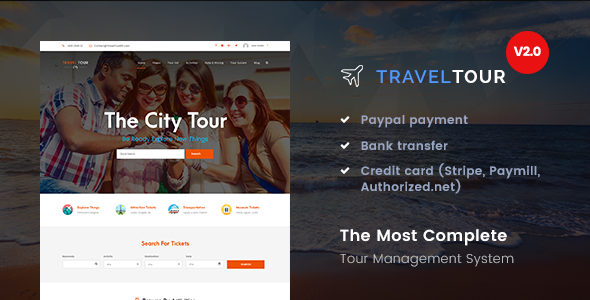 Additional features of Travel Tour are group discounts, tour searches, group messages, coupon codes, booking bar, different payment methods, a unique dashboard for users, 19 header styles, and an intuitive theme panel. 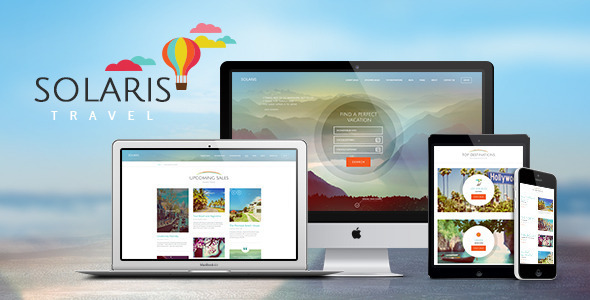 When it comes to travel agency WordPress themes, Travel Tour is a great solution! 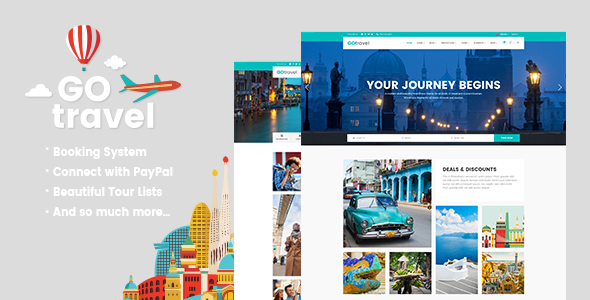 GoTravel is a friendly, jam-packed with features, cute and stylish WordPress theme that will be a great fit for all travel related businesses. GoTravel’s intuitive and gorgeous design will make it loads easier for your audience to navigate through your content and offers allowing them to make a purchase faster. 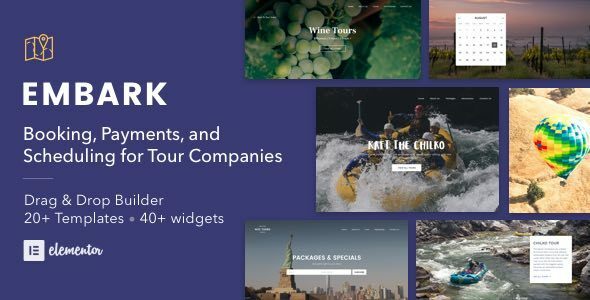 GoTravel has tour layouts and templates, newsletter subscription, tour filter, discounts section, destination grid, reviews section, loads of page templates, dazzling maps, and a few useful widgets. As you might have guessed, this theme is also fully compatible with some of the most popular plugins on the market: WooCommerce, Slider Revolution, and Visual Composer. Do your business justice with GoTravel! Great travel agency WordPress themes will instantly make your visitors want to explore and travel, and Altair is one of those themes. However, looks are not everything and performance is equally as crucial this is where Altair rises up to the occasion once more. This theme is both beautiful and feature packed. Altair comes with unique booking forms, tour search, parallax effects, why choose us section, an easy to use documentation, built-in shortcodes, social media support, free updates, and great support. Altair will create a charming and welcoming undertone to your website and keep your visitors coming back for more. People first look for travel offers and options online before going out of their way to find the physical business; this is why it is important to also have a website. LeadEngine is the key to doing it smartly and gain a following by making a great first impression. 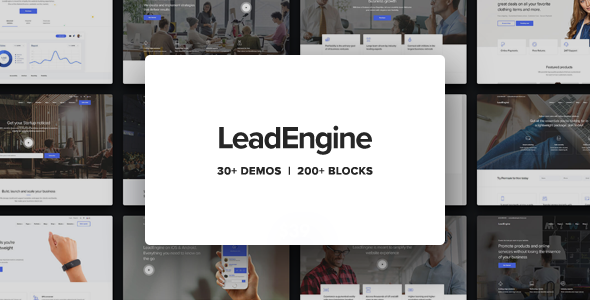 To help with that, LeadEngine has a bunch of features such as 30 demos and 200 blocks, social media buttons, 3 premium free plugins, portfolio layout, online store page, extensive documentation, lifetime free updates, multiple typography and color skins, child theme included, and much more. These features will help you display all your necessary information in a professional and easy to navigate way. Quit slacking and try out this amazing travel agency WordPress theme today! Sometimes first impressions count the most when it comes to travel agencies websites. Seeing your dream city, country and vacation from the moment you open a website can influence you into buying. Because of this reason alone, Embark is the perfect theme to get and impress visitors. Embark has a lovely, colorful, and highly customizable design that you can make fine adjustments to in order to fit your vision. Among this theme’s features you will find 3 pre-built demos, over 40 widgets, more than 20 templates, Google calendar, forms, tour manager, drag and drop builder, anti-spam, payment gateways, and video backgrounds. Embark on the journey of a lifetime with this incredible theme! Travel agency WordPress themes have to have the ability to make visitors day dream when they enter your website and Love Travel accomplishes this without effort. Every single element of Love Travel combines utility with beauty making it one of best travel agency WordPress themes on the market. 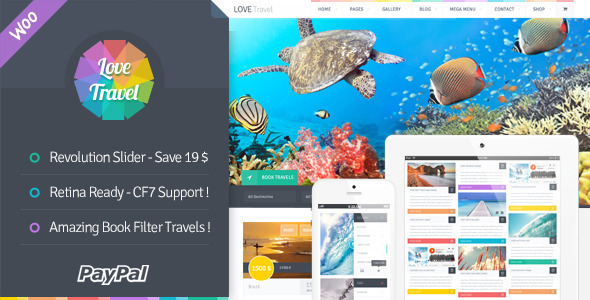 Love Travel comes with customizable shop pages, WPML support, map, booking system, video support, full screen layout, stunning galleries, parallax sections, shortcodes, counter, rain effect, and excellent support. Whether it’s looks or functionality, Love Travel shines on both. 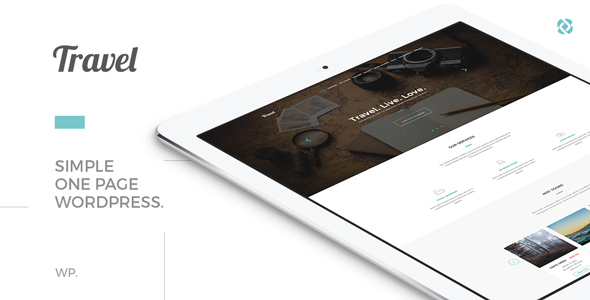 This is an impressive premium theme that will make your business stand out. Standing out of the crowd, especially in the online world, is not easy. You need to display all your guns upfront in order to make clients come to you, and Solaris is the perfect template for that. This theme is highly customizable and completely responsive packed with Visual Composer, Slider Revolution, vacation request form, translation options, WooCommerce integration, multilingual support, shortcode builder, and media manager. With Solaris you can create both a flashy and colorful design and a clean and minimalist one. Try Solaris! 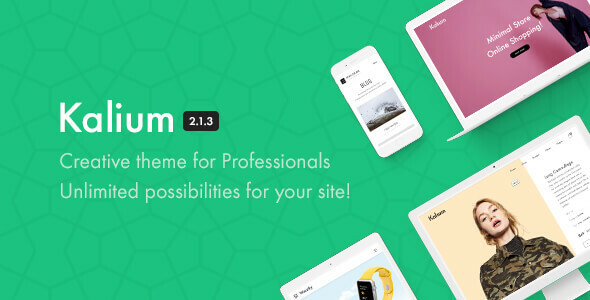 Kalium is a multipurpose WordPress theme that lets you focus on your business while it does all the work. This theme is modern, fresh, original, and adaptable to any niche. If you use Kalium you will be able to set up your website in a few minutes without any coding required. Kalium offers pretty much unlimited customizing options and design elements. To name just a few, Kalium includes lots of pre-made website demos, unlimited typography options, 5 free premium plugins, RTL and multilingual support, portfolio templates, interactive hover effects, and limitless skins. Develop your dream website with Kalium! As far as travel agency WordPress themes go, Trendy Travel is one of the most powerful, glamorous, and attractive you can find. Trendy Travel will allow you to display your most popular offers in an irresistible way so you can attract more and more customers. This theme contains features for days such as a powerful page builder, search form, events calendar, holiday and gift packages, tour packages, hotels and location information, mega menu support, Google fonts, Slider Revolution, a couple of homepage layouts, custom posts, and header styles. You will get your money’s worth if you purchase Trendy Travel! It is important to get a travel agency WordPress theme that allows tweaks and changes without getting deep into the code, as well as make your audience feel welcomed and entertained. If you want these needs fulfilled then check out Travel WP. 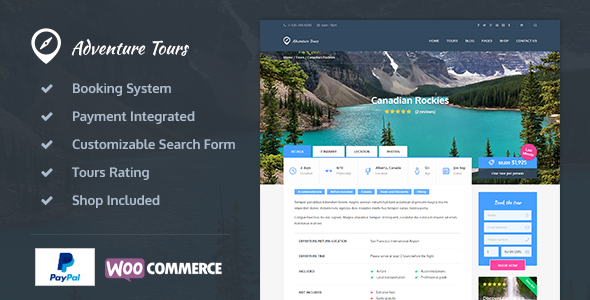 This theme comes with all the tools necessary for running a successful travel agency website like WooCommerce integration and payment methods, tour pages layouts, a booking system, customizable and filtered search, prices by day, related section, rating system, and a few pre-designed original demos. Anything is possible with Travel WP! 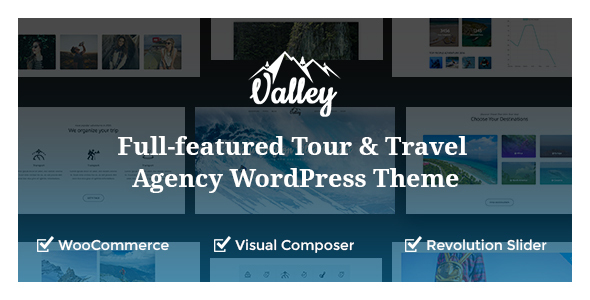 If you are searching for a complete and flexible travel agency WordPress theme then look no further than Valley. This theme is ambitious, crisp, elegant, and efficient. Theme installation takes a couple of minutes at most, and the set up can be easily done from the intuitive theme panel. Valley’s layout is responsive, adaptable to any screen size, and beautiful. Furthermore, with Valley you also get a drag and drop builder you can use to build original page templates and layouts. This theme will meet and exceed all of your expectations. Check Valley out! We all have to face the obvious – we all lust after a great vacation. Sure, working gets you a paycheck, but sometimes you really need to spend some time away with your family or friends. If you want to inspire your visitors to take a break from work then Travel is the tool you need. Travel agency WordPress themes can sometimes look alike, but Travel sure knows how to stand out. Apart from its refined design, this theme also packs some powerful options such as a responsive full width slider, portfolio section, tour showcase, hotel review system, blog template, Google map integration, and intuitive forms. Give Travel a shot if you want to make a long lasting first impression! Happy Events is a versatile, brilliant, eye-catching, mesmerizing, and user friendly travel agency WordPress theme. While it can adapt to various domains, Happy Events also has the necessary skills for a travel related website. Happy Events has you covered from the menu and slider all the way to the shop page and footer. 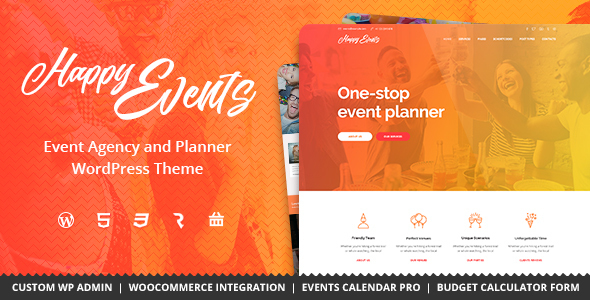 This theme also offers a calculated form, events plugin integration, Instagram feed integration, drag and drop page builder, portfolio layouts, custom widgets, 99+ shortcodes, custom colors and background, and much more. While this theme might not be as popular as some other on this list it still comes with a ton of features and options. Grand Tour is the ideal solution for travel agency WordPrese websites because, you’ve guessed it, it was designed and developed for this task. 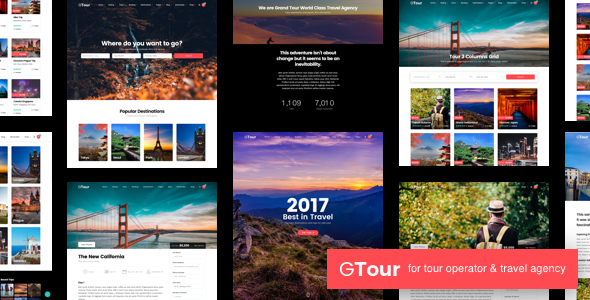 Grand Tour comes equipped with the demo content, a try before you buy option, pre-made demos, information about tours, view count, stunning gallery, video support, related tours recommendations, social media sharing buttons, booking system, payment methods, discounts and codes, easy to use search form, autocomplete search, reviews, popular tours, and tour templates. Freshen up your website with Grand Tour! 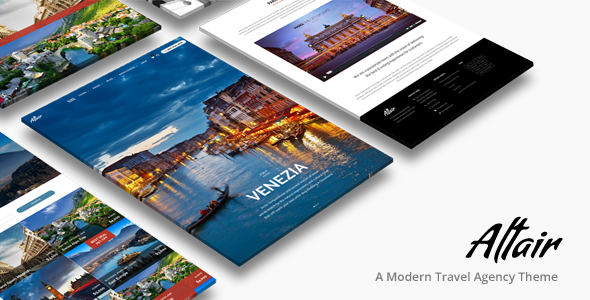 KodeTravel is a beautiful and visually stunning travel agency WordPress theme that includes a variety of cool and unique design elements perfect for impressing new visitors. KodeTravel does not contain a single element or feature that is redundant; everything is useful and highly customizable. Some of its practical features are a tour manager, various blog designs, gallery styles, homepage layouts, SEO friendly code, header options, most popular destinations, dozens of fonts, and a useful page builder. Once you built your main foundation using these features you can add your own style through small tweaks here and there. If you want a gorgeous online representation of your business try KodeTravel. If used correctly, Book Your Travel can be the best travel agency WordPress theme you can find. This theme has an exceptional, different, incomparable, and dazzling design that will surely reflect your business in a positive light. Book Your Travel incorporates accommodation options, room facilities, filterable search form, guest configuration, integrated payment gateways, pricing options, tour management, cruises management, rent a car features, and many more. With Book Your Travel the sky is your limit! It should be obvious that a good looking website will gain you more followers and clients. 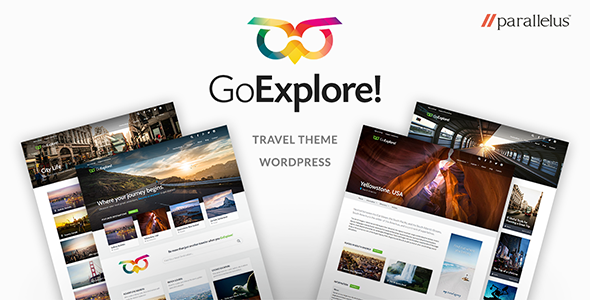 If you want to invest in a gorgeous theme, then choose GoExplore! This particular travel agency WordPress theme puts design first, but is also jam-packed with tools. GoExplore is integrated with a travel destinations plugin which allows you to add, delete, and edit destinations directly from your dashboard with minimal effort. GoExplore is optimized for speed as well as SEO which combined will get you a high ranking on Google. To learn more about it, click on live preview button below. 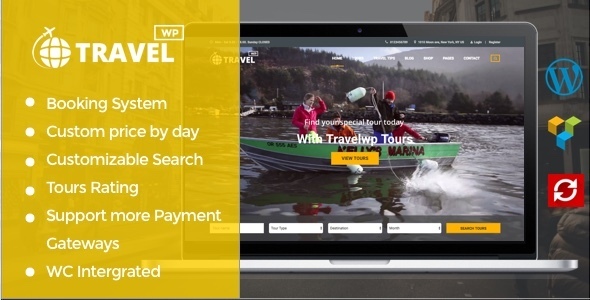 To engage with your visitors you will need travel agency WordPress themes that have interactive and eye-catching features, like Adventure Tours. With this theme you do not have to worry about integrating a payment system and design a shop page because it has them already included. Additionally, it comes with a coupon system, all the demo data, unlimited fonts and colors, custom icons, and a booking system. If you get Adventure Tours you don’t have to make any waves to make your business stand out, as this theme will do all the work for you. Once you check out the live preview, you will have to admit that Adventure Tours is an excellent theme. Traveler does not mess around and comes with a membership function, calendar synchronization, inventory manager, affiliate system, booking option, a couple of check out options, Visual Composer, various demos, PayPal integration, and more. Traveler will cater to your needs and help you develop a one of a kind website from scratch. Furthermore, visitors will be able to access your website from any device and browser because this theme is responsive and has an adaptable layout. Check out what Traveler has to offer! 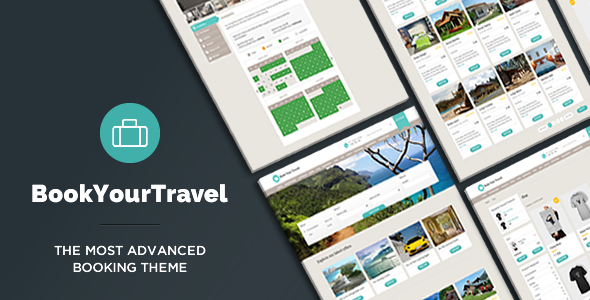 Travelkit is an attractive, competent, chic, pristine, and fun travel agency WordPress theme. Travelkit has the incredible skill of drawing in audience and keeping them interested. Its design balances perfectly between classic and innovative. 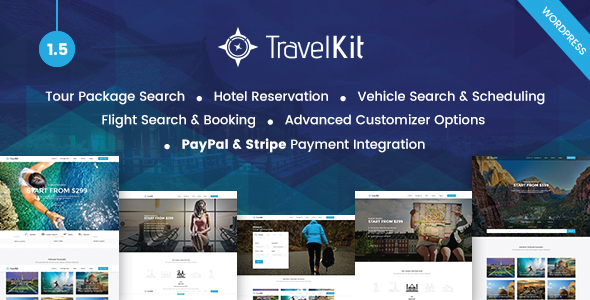 Travelkit is bundled with 5 flexible demos, tour packages, hotel booking, flight booking, filterable destination search, and other much needed travel related tools. One of the most competent travel agency WordPress themes out there!